With the Offshore Diver, Audemars Piguet has created a Royal Oak for divers. The watch is equipped with a rotatable internal bezel to allow for the famous octagonal bezel. Highly precise in-house calibers provide these pieces with their reliability. As the first proper Audemars Piguet diving watch, the Royal Oak Offshore Diver marks a milestone in the Le Brassus-based manufacturer's history. While it's true that some older Offshore models were well protected against water, the Offshore Diver is in a league of its own. It is water resistant to 300 m (30 bar, 984 ft) and can compete with classics such as the Rolex Submariner, the Omega Seamaster 300, and the Blancpain Fifty Fathoms. Like the other Offshore models, the Offshore Diver feels significantly more massive than the classic Royal Oak. Its case is 42 mm in diameter and over 14 mm thick. Some Diver models feature the same colorful rubber straps and méga-tapisserie dials as their sister models. Despite the Diver's differences, it still takes only a glance to recognize it as a Royal Oak thanks to its iconic case shape. The octagonal porthole bezel with eight hexagonal screws also remains. The engineers at Audemars Piguet moved the unidirectional bezel necessary for a diving watch to a movable rehaut ring around the edge of the dial. The ring is operated using a second screw-down crown at 10 o'clock. The hands, indices, and scale on the rotatable bezel all glow in the dark to guarantee readability, even in murky waters or poor light conditions. An in-house caliber means you can rely on it to display the time accurately, while sapphire glass and a stainless steel case protect the watch from water damage. 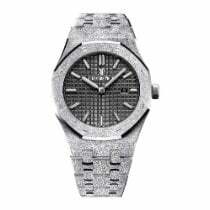 How much does the Royal Oak Offshore Diver cost? Audemars Piguet offers a number of different versions of the Offshore Diver with three hands. Some models differentiate themselves from each other by not only their case materials but also by the color of their dials and bands. The proven in-house caliber 3120 powers every watch. The most affordable version comes in stainless steel with a black dial and matching rubber strap. You can get an older example – recognizable by the stainless steel case back – for between 14,000 and 15,100 USD, depending on its condition. More recent models feature a sapphire glass case back and cost between 16,300 and 18,600 USD. Variants with a white strap and dial sit in a similar price range. Fans of bright colors will find a wide selection of options in the AP Diver collection. These timepieces come in a rainbow of colors including various shades of blue, green, yellow, orange, purple, and mother-of-pearl. 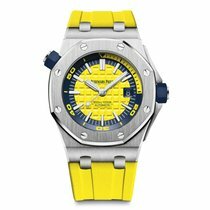 Prices for these colorful diving watches begin around 19,800 USD for the yellow edition to 29,000 USD for the one in a brilliant orange. The Offshore Diver comes in more than just stainless steel cases. You can purchase a model in black carbon with a black ceramic bezel starting around 23,300 USD. Models with all-ceramic cases are also quite interesting. Set aside about 23,300 USD for the black version and 28,000 USD for the one in a radiant white. Audemars Piguet combines 18-karat rose gold and titanium for the elegant bicolor editions. You'll need a good 41,900 USD for one of these treasures. The Royal Oak Offshore Diver made its premiere as a chronograph in 2016. The in-house caliber 3124/3841 serves as the beating heart of this timepiece. It had previously been exclusive to the Jules Audemars Chronograph. This movement provides the watch with a small seconds dial at 3 o'clock and a 30-minute counter at 9. Sadly, it lacks any date display. As seen in the three-hand models, this watch also features an interior rotatable bezel that is operated using an additional crown at 10 o'clock. It comes in the same bright colors as its sister model as well. The yellow, orange, and blue editions of the Offshore Diver Chronograph sell for around 28,000 USD new and 23,300 USD in good condition. If you prefer the green model, you will have to dig a bit deeper into your pockets. Expect to pay around 39,000 USD for a never-worn example and almost 28,000 USD for a pre-owned one. 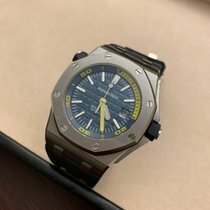 Shortly before Audemars Piguet presented the Offshore Diver, there had already been a few strictly limited boutique diving models of the Offshore. They were given the name 'Scuba,' contained the caliber 2325, and measured in at a rather large 44 mm. The interior bezel and its crown at 10 o'clock first appeared on these models. The Scuba Wempe is one of these limited models. Only 175 examples of this watch were produced for the jeweler Wempe. 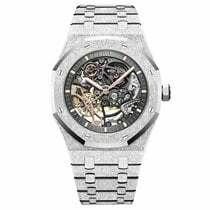 This timepiece costs about 10,500 USD in mint condition. At 18,600 USD, the Scuba Red is markedly more expensive. It also had an extremely limited run and stood out thanks to its red rotatable interior bezel. The Scuba Bartorelli is yet another example. This watch in black-coated stainless steel with a bronze bezel was limited to 25 pieces and costs around 27,400 USD today.